This is the ideal river journey for those who like a faster paced paddle and a bit of a challenge. This trip blends rural countryside with Bedford’s stunning and historic Victorian Embankment, finishing at the beautiful Grade I Listed bridge in Great Barford. 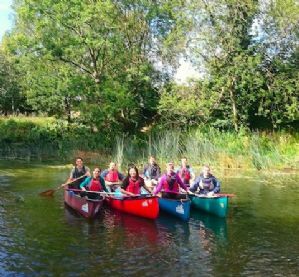 You start just below Kempston Mill and paddle downstream through picturesque river meadows with lots of wildlife to see. You will portage (carry your boats around a weir) four times, allowing you plenty time to stretch your legs. Once back on the river the gentle flow will take you towards Bedford town centre with its tree-lined embankment and promenade. You pass under several historic bridges before arriving at Longholme Cafe where you can get tea, cake and freshly prepared food. You portage here to the lower river which taking you back into the countryside again for the next leg of your trip. The river meanders past Priory Country Park towards Willington and the Danish Camp riverside cafe. Just past there you portage for the last time and paddle down to the sleepy riverside village of Great Barford and the Anchor Pub.